Legal Week NY 2017 is just around the corner! 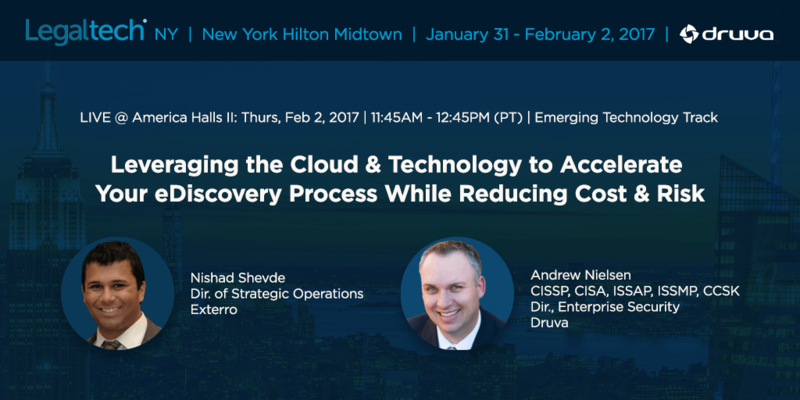 On Thursday, February 2, 11:45am - 12:45pm, join subject matter experts Andrew Nielsen, Director of Enterprise Security at Druva and Nishad Shevde, Director of Strategic Operations at Exterro, for “Leveraging the Cloud & Technology to Accelerate your eDiscovery Process While Reducing Cost and Risk.” Andrew and Nishad will be discussing the latest cloud technology solutions for enterprise backup, archiving and e-discovery response, and how integrating your solutions in the cloud can lead to dramatic cost reductions, efficiency improvements and better outcomes. Strategies to store and maintain visibility of data, reducing risk due to spoliation or employee termination. Timely, efficiently and defensible data collection with reduced storage requirements. Reduction of overall downstream data, reducing costs during review. Andrew Nielsen adds, "Traditional e-discovery processes are highly manual and reactive which put organizations on the defensive when it comes to the collection and preservation of electronic information. Add the complexities of collection from mobile devices and cloud applications, organizations are even more exposed. With the scalability and cost savings of the cloud, organizations can take a proactive stance to data collection, while streamlining their e-discovery processes." If you’re in New York next week, come by and check out the latest insights from these two speakers!